Here is some info I was able to gather when I was recently researching into extended wheel studs for my prelude. Hopefully it will be useful to some. You will want to find yourself a set of extended studs with a .480"-.485" OEM knurl diameter. In the past, ARP didn't offer a honda compatible knurl diameter on their extended studs. So people had to resort to drilling, welding, etc to install them. -Under Head length: 1.65" (42mm). Dorman rear studs from the 1997 Acura TL 3.2. Under Head Length: 1.89" (48mm) UH length. Extra 6mm of length, and it might have the extra threads necessary for a 10mm spacer, but cannot guarantee. With this stud, you can continue to use closed ended lug nuts for a cleaner look. 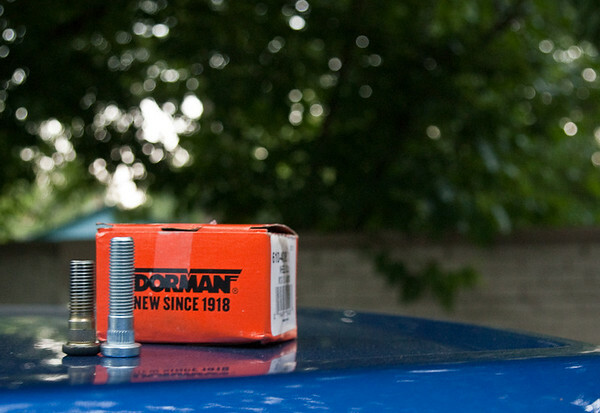 Your local autozone should carry the dorman studs for around $1.99 a stud. Typically a store will only have 2-3 studs on hand though. 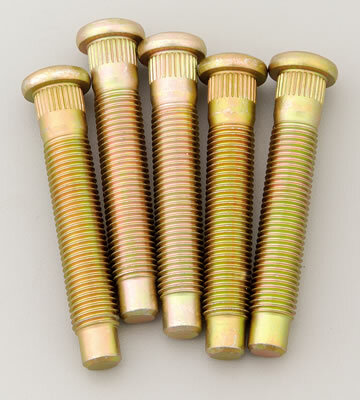 www.rockauto.com also has them for around $1.80 a stud. Search "610408"
These are the only ones I have found so far, there might be some longer OEM style studs out there that might work. I am using the Dorman 610-408 studs with no issue on both my front and rear hubs. 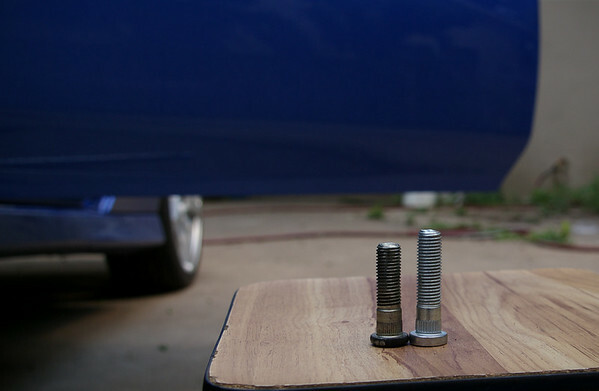 H&R recommends a minimum of 6.5 turns on the lug nut for safety if you plan on using a spacer. I'm using a custom 7mm spacer and I can secure my wheels with around 8 turns on the front. With a 7mm spacer on the rear, I can recall having around 10+ turns. Last edited by EBPludeSH; 07-23-2010 at 02:41 PM. Thanks EBP, I was thinking about this the other day. I didn't look to far into it because I'm not quite there yet but now I don't have to thanks to you! The extended studs for the rear go in perfectly fine for the 5th gen.
As far as your rear hub.. we have the same situation on the front hub. I went with this writeup for my front studs and it worked perfectly fine. It should work for you on the rear. No problem man.. hopefully some of the info here will be helpful in the future. Good guide, sure it will be helpfull soon. good write up. def didnt know about those knurl dia. does anyone know the knurl dia on the blox extended studs.